Rilwan ‘Real One’ Oladosu displays his Cheque and the Mojisola Ogunsanya Memorial Trophy he won at the GOtv Boxing Night 17 held in Lagos…at the weekend. Nigeria’s Segun “The Machine” Wahab at the weekend won the World Boxing Federation (WBF) Intercontinental Superfeatherweight boxing title by defeating Tanzania’s Issa “Peche Boy” Nampepeche at GOtv Boxing Night 17. 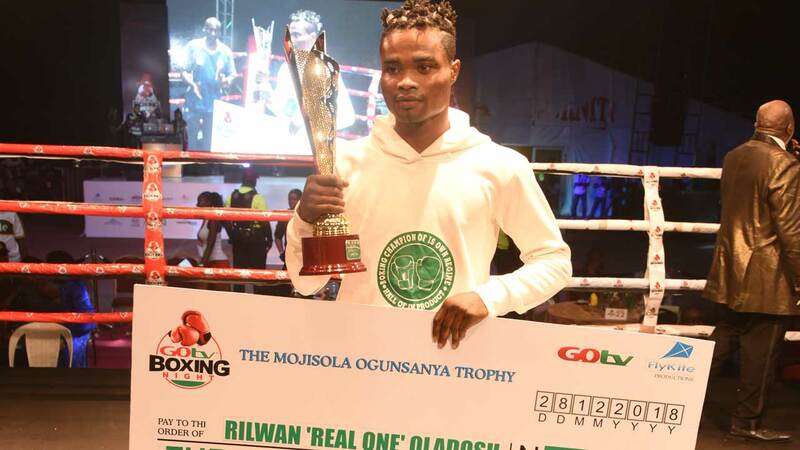 Also, Rilwan “Real One” Oladosu, won the Mojisola Ogunsanya Memorial Trophy for the best boxer on the night and claimed the cash prize of N3 million when he knocked out Mubarak “Morgan” Hamzat in a national lightweight contest. Oladosu, the reigning West African Boxing Union (WABU) lightweight champion, matched his pre-bout boasts as his rapid, all-action style saw him knock out his opponent in the first round. Another entertaining contest saw US-based Nigerian, Oluwafemi “The Eagle” Oyeleye victorious over his Ghanaian opponent, Victus Kemavor, in a middleweight challenge. Olaide “Fijaborn” Fijabi enhanced his reputation as he defeated Yusuf “Murphy” Mufutau in a national light welterweight challenge. Mufutau threw in the towel in the eighth round, the bout’s last round. In another action-packed contest, reigning African Boxing Union champion (ABU), Oto “Joe Boy” Joseph secured a unanimous decision victory over Hammed “Ese” Hammed Ganiyu in a national lightweight challenge. Joseph maintained his cool as he was forced to go the distance of eight rounds fight by his hard-hitting opponent. Other bouts saw Ridwan “Scorpion” Oyekola knockout Nurudeen “Prince” Fatai in a national superfeatherweight challenge, Femi Akintayo crushed Ebubechukwu “Coded Man” in the fourth round of their national middleweight challenge, while 18-year-old Opeyemi “Sense” Adeyemi defeated Saheed “Gbeminiyi Ahmed in a national bantamweight contest. 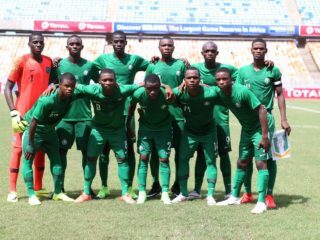 There were also spectacular musical performances on the night from some of Nigeria’s biggest music stars, including Burna Boy, Wande Coal, Teni Da Entertainer and Daddy Showkey, as well as a lively display from upcoming act, OJ Flames.